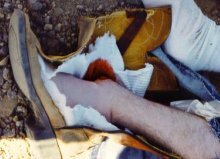 If you need urgent Fracture First Aid right NOW click here or continue reading to gain information on fracture types and signs of a fracture. Greenstick fracture - It gets its name as it looks just like a green twig, all jagged, when it is bent and snapped. This fracture is most common in children as they have flexible bones that are still maturing. At times it can be very difficult to tell if the bone is fractured, sprained or dislocated. Dislocations and sprains should be treated as you would a closed fracture. A dislocation is when a joint, such as a knee, ankle, or shoulder, has come out of its socket or correct position. 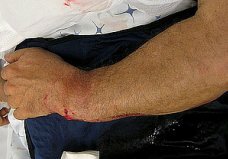 A sprain is when the connecting tissues of the joints have been torn. Severe pain at injury site. Difficulty in movement of the area. Swelling and/or bruising. Swelling in a fractured area happens rapidly. Deformity like abnormal twist of limb. Sharp pain when the individual attempts to move the part.